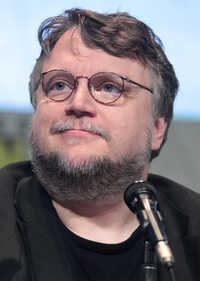 Guillermo del Toro Gmez (born October 9, 1964) is a Mexican film director, screenwriter, producer, and novelist. In his filmmaking career, del Toro has alternated between Spanish-language dark fantasy pieces, such as the gothic horror film The Devil's Backbone (2001), and Pan's Labyrinth (2006), and more mainstream American action movies, such as the vampire superhero action film Blade II (2002), the supernatural superhero film Hellboy (2004), its sequel Hellboy II: The Golden Army (2008), and the science fiction monster film Pacific Rim (2013). In addition to his directing works, del Toro is a prolific producer, his producing works include acclaimed and/or successful films such as The Orphanage (2007), Julia's Eyes (2010), Biutiful (2010), Kung Fu Panda 2 (2011), Puss in Boots (2011), and Mama (2013). He was originally chosen by Peter Jackson to direct The Hobbit films; he left the project due to production problems but was still credited as co-writer for his numerous contributions to the script. This webpage uses material from the Wikipedia article "Guillermo_del_Toro" and is licensed under the GNU Free Documentation License. Reality TV World is not responsible for any errors or omissions the Wikipedia article may contain.